These are some of the most interesting multi-million dollar cars for sale at this year's Pebble Beach collector car auctions. Powered by a 300-horsepower V12, this Ferrari is one of only ten such cars ever made. The Italian supercar-maker's U.S. importer, Luigi Chinetti, wanted a street-drivable open-top car that his customers could race successfully at the track. The cars he requested were named for the hugely successful North American Racing Team. With the proceeds from this car going to charity, this was the single most expensive car sold at the week of events centered around the Pebble Beach Concours d'Elegance, a classic car show held in California. 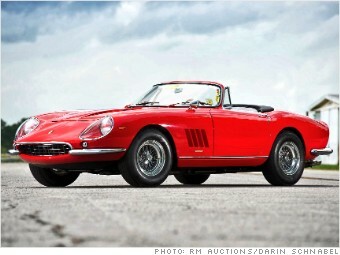 In fact, the price set a record for any road car ever. Ordinarily, a charity connection would raise the selling price of a car. But not at this level, according to McKeel Hagerty, head of Hagerty Insurance, the collector car insurance company. At these prices, nobody's paying more than the car is actually worth.